Once a year, our neighbourhood hosts a garage sale. This year we decided to participate. We had a few things to sell, and kids just got a toy cash register for a gift, so this was a perfect opportunity to teach them about counting money, offering items for sale, and bargaining. It takes more than laying things out on the driveway to create a good experience for everyone involved, maximize your sales, and, most importantly, have fun. 1. Think what you have to offer and get it ready. Find the items the day before and prepare them for sale. Make sure everything is clean and works, put batteries into gadgets that need them. 2. Have change at hand. Get more than you are likely to need – it’s better to have lots of change left over than to run out and lose a sale. My kids had lots of fun learning about different coins and sorting them into the cash register compartments. 3. Clearly price the items and prepare signs ahead of time. 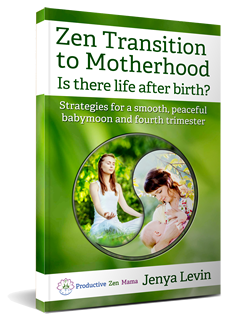 Suggest discounted multiple pricing – people are tempted by bargains. Place the prices close to the road – many people simply drive by to see whether anything interests them, so it’s good to let them quickly scan the items you have to offer and their price. 4. Group several items together – it’s easier to browse groups than individual items spread out all over the driveway. Group related items separate from the others. 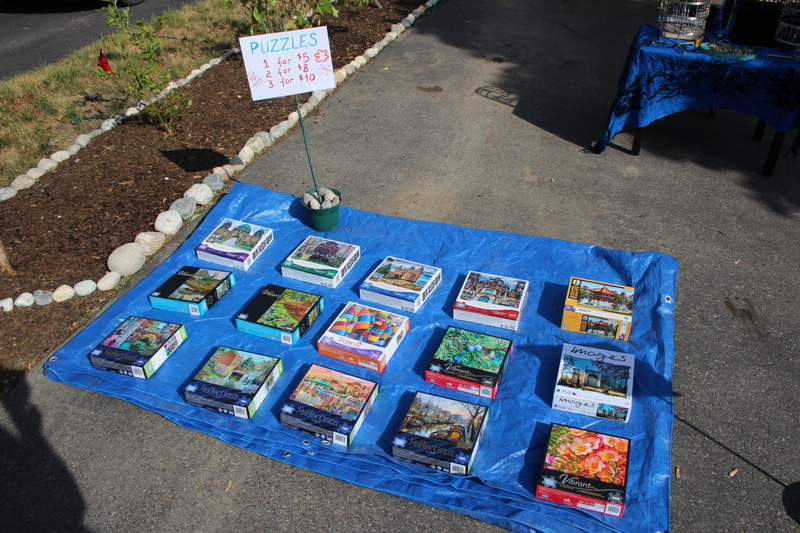 For instance, I had several jigsaw puzzles, so they formed their own group. 5. Protect fragile things and those that get dirty easily. I’ve placed the puzzle boxes on a tarp instead of putting them directly on the pavement, to prevent them from getting scratched and dirty. 6. Think outside of the box – people are not interested only in furniture, books, appliances, and electronics. I had lots of seeds left over, grown by me from saved seeds. 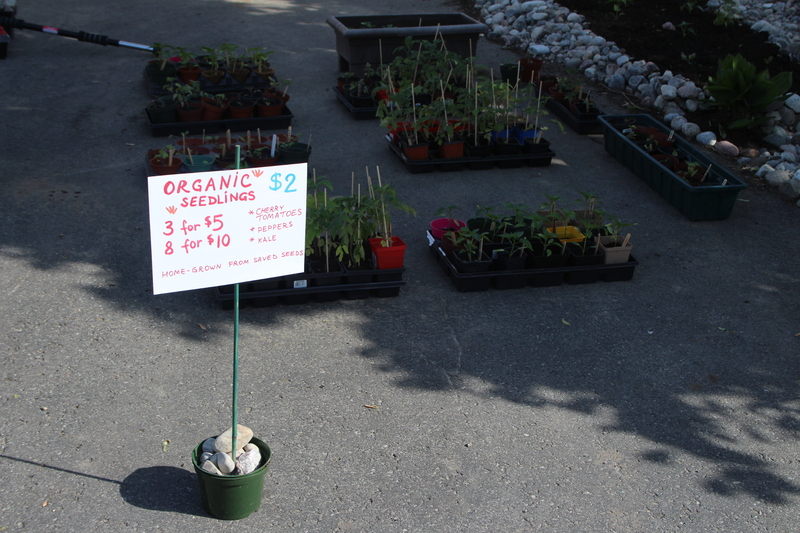 Lots of people are interested in organic seedlings, but don’t think of going to an organic garden centre, so here was an opportunity for them to pick up some kale, tomatoes, or bell peppers. I had a hose handy and watered the seedlings throughout the day. 7. Be creative. 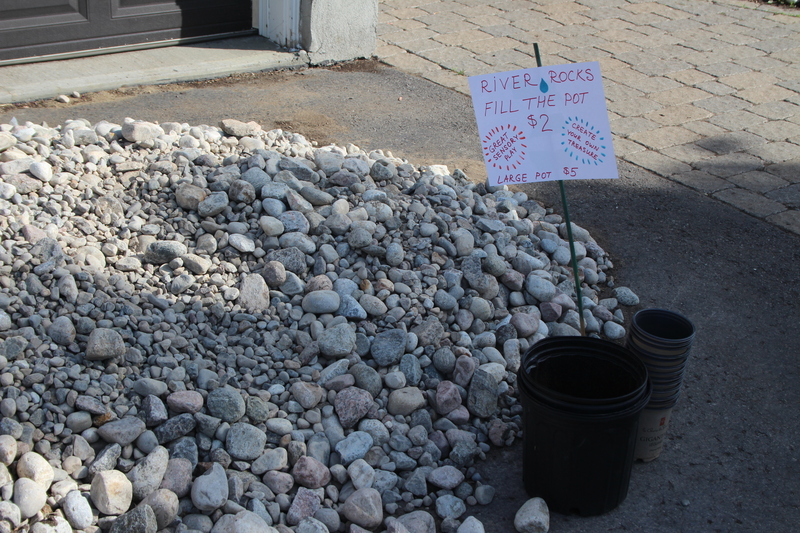 We had a large pile of river rocks on our driveway, since the sale took place during our edible landscaping project. We knew we had more rocks than we needed, so I added them to the sale. After all, I’ve often looked for river rocks to build a pond border, create a centerpiece, decorate the garden, or paint. 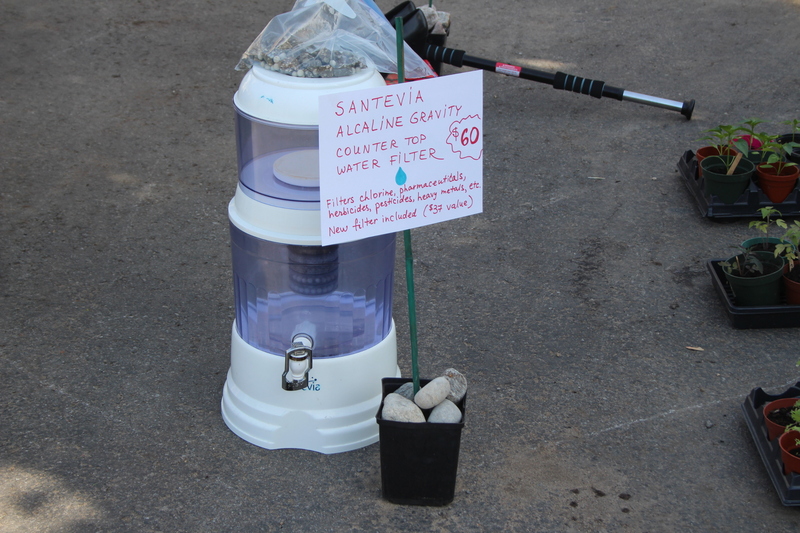 I’ve also used the rocks themselves to hold my price signs up, and it worked really well on a windy day. 8. Write down answers to most common questions buyers might ask right on the price label, as to what a thing is, what it does, and why it’s great. For instance, I’ve spelled out a few of the major contaminants the Santevia water filter system would remove and mentioned that it has a new filter. 9. Set up before starting time and stay open until closing. It’s very frustrating to plan on coming to a garage sale, only to discover that it closed before we arrived, earlier than the schedule indicated. 10. Advertise. Even though the neighbourhood association advertises the entire sale, put your specific items online. I took these photos after everything was set up on the driveway, and posted them to kijiji and Facebook, with the invitation to come to my specific street address as part of a larger neighbourhood garage sale. This way, you can reach more people. People who were coming anyway, will come to your place if they see what they need in the ad. People who might be interested in one of your items, will have another incentive to come if they know there is more than one garage sale happening nearby. Don’t forget to remove the postings after the sale is over. 11. Greet everyone. Smile and wish people a good morning. No one wants to buy from a grumpy hermit, and you might get some sunny vibes back. 12. Be present to answer questions the buyers might have, but don’t crowd the people who just wish to browse. 13. Be prepared to bargain. I wasn’t, and was a bit overpowered by the onslaught of two ladies who were interested in the samovar, and bargained with ferocity reminiscent of a Russian bazaar. 14. Involve your kids. They might like to play store. If they don’t feel up to it (my oldest was quite impatient when people did not buy anything for an entire 10 minutes), have an alternate plan. We played word games outside, drew with chalk on the driveway, played with rocks and coins. When the kids got tired and went to have lunch, I used the time when no one came by to finish building the rock borders in the front garden and water the plants. 15. If you are so inclined, and if the sale goes past a mealtime, have refreshments and/or snacks for sale. Avoid sweets — last thing parents need is a tantrum from a child insisting on getting another sugar-bomb. Think fresh and healthy. Above all, have fun. I wasn’t counting on selling much. 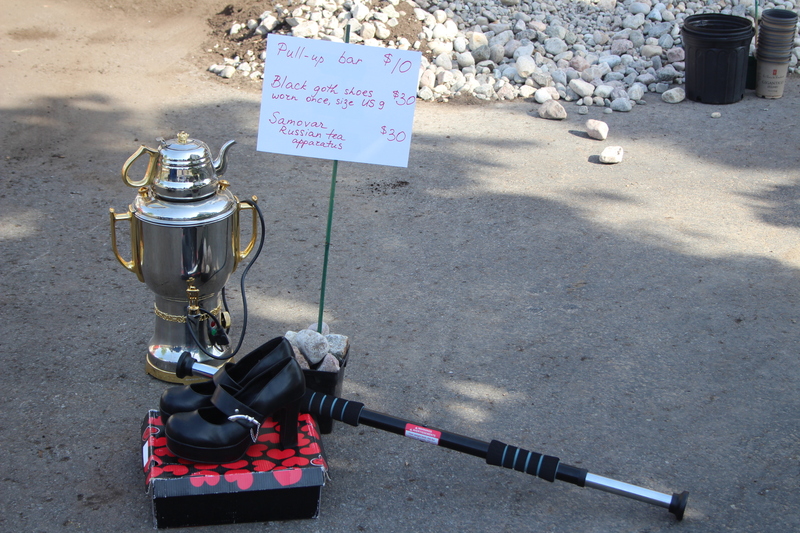 Yet, at the end of the day, the samovar, five puzzles, and eighteen seedlings found a new home, and I was able to pay for garden stepping stones with the money I raised during the garage sale. More importantly though, we had a fun time with kids that morning and spent lots of time outside enjoying our front garden and each other’s company.